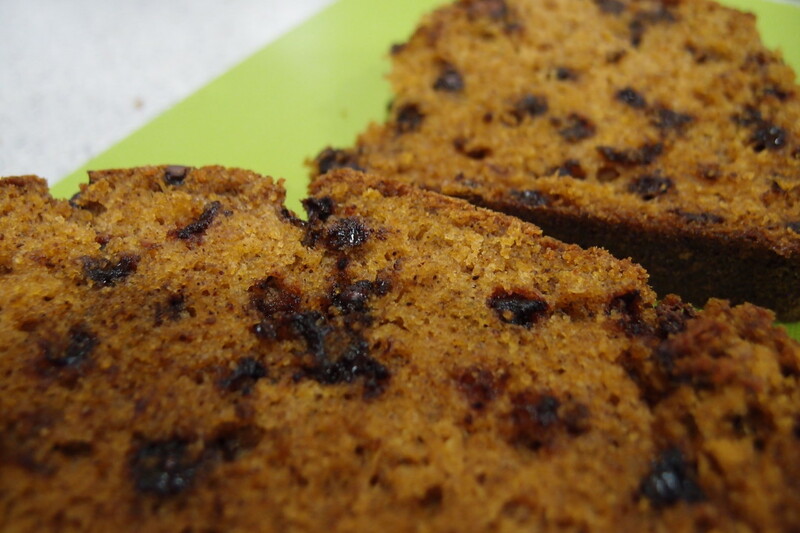 I am a pumpkin spice chocolate chip bread and I am ready for fall. I am ready to be eaten. It’s October, everyone! HURRAY! PUMPKIN SPICE EVERYTING! I love pumpkin. I love it and I try to eat as much of it as I can. I like to add pumpkin to my soups, bean, and pastries. I am a full time pumpkin enthusiast. Last year, around some time this month my friend Lisa Brank took me to this festival that was held back in her hometown. It was so much fun! I had funnel cake for the first time and that was pretty much life changing but that wasn’t the only thing I ate during that outing. I wanted to visit every stall because why not? My favorite one was one that had food on it. I don’t remember the name of the bakery which is a complete shame, but they had chocolate chip pumpkin bread samples. They gave me one… and I think my little pumpkin loving heart exploded because I bought two loaves. Since then I haven’t stopped thinking about that bread which is why I MADE MY OWN! Oh look, here I am as a delicious pumpkin spice loaf. I am chocolate filled and delicious. Before we begin this recipe, it needs to feel like fall. You need to embrace fall and it’s pumpkin spice loveliness fully if you are to make this bread scrumptious. If it’s truly still summer in your soul, please refrain from attempting this recipe. The pumpkin will taste more like watermelon and sunshine if you think of summer. Don’t do that to yourself. Don’t do that to this bread. Is it fall in your heart? Are you wearing a pumpkin sweater? Is there a little pumpkin decoration somewhere in your kitchen? If yes, proceed and preheat your oven to 350 degrees. In a large bowl, mix your eggs, sugar, vanilla, pumpkin, and spices until blended. If you’d like, you could listen to some Halloween music or have your favorite Halloween movie playing in the background. This will allow the ingredients to really soak up the Halloween spirit. Once those are mixed, add one cup of flour, baking soda, salt, and the oil. Mix those together and then add the other cup of flour alongside the milk. Mix for a bit not too much, you don’t want a tough cake! The last thing you want to do is add the chocolate chips. I like my pumpkin flavored things to taste more like cinnamon than anything else, which is odd because I’m not a huge cinnamon fan but it just goes so well with pumpkin! Now, I added a little more than half a cup of mini chocolate chips because I prefer using minis for loaves. I think the smaller chips make it easier to cut. However, you can easily use milk chocolate chips or even white chocolate chips! You can add cloves too! I didn’t have any and I don’t particularly like the taste of cloves BUT I know a lot of you fall loving individuals do. Grease your loaf pan with butter or any kind of pan lubricant like sprays or whatever. Don’t use margarine. Margarine is pretty much oil so you’ll be coating your pan with oil and it’ll make it look all burnt. You don’t want that. Pour your lovely loaf mix into the pan and bake for 45-60 minutes. I don’t really like giving you guys times because every oven is different. My suggestion is bake it for 3o minutes if you’re unsure. If it looks like it’s moist and has not completely risen give it 10-15 minutes (you might need to add 5-10 more minutes depending on your oven). If it’s risen and you feel like the loaf is ready to be in your mouth, pierce it with a toothpick, right in the center of it. Pretend it’s a vampire and toothpick through loafy heart! If it’s clean, your loaf is ready to be gorged upon. 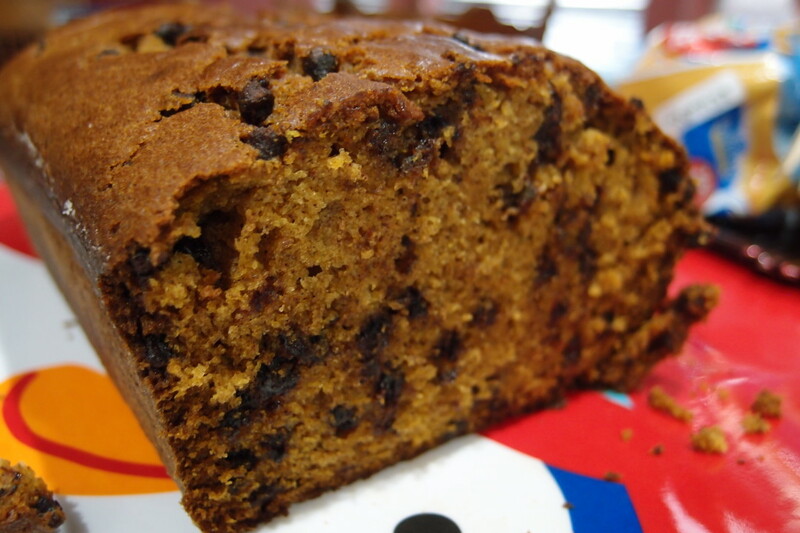 It’s just me again, the pumpkin spice chocolate chip bread looking fine with my sister here. She’s ready for fall too. I am excited to start cracking out some pumpkin recipes this month! This looks insanely good! Thank you so much! Yes, please do! I would love to see your recipes. Nothing better than anything with chocolate chips! Right? I hate when people give me an oatmeal cookie and it has what looks like chocolate chips but they’re actually gross raisins. 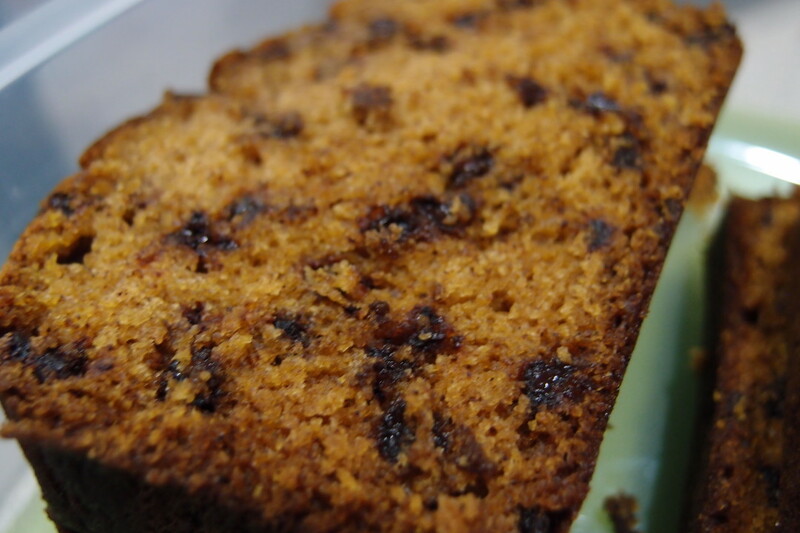 Pumpkin bread + chocolate is pure heaven! I AM SO ADDICTED TO PUMPKIN ANYTHING. Love it!